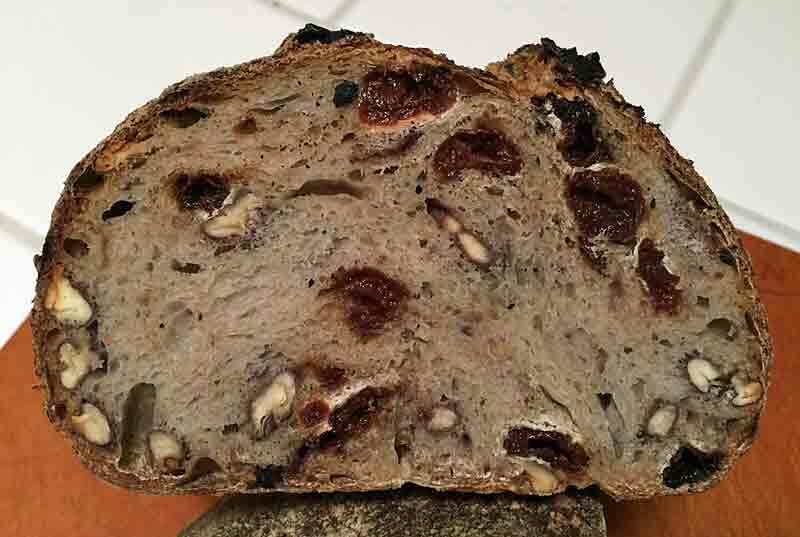 This week, I baked another dried fruit and toasted nut sourdough bread. I really like the combination of eathiness from the nuts and the sweet tanginess of the pieces of dried fruit. The nut flavors seem to permeate the crumb while the fruit yields surprising little explosions of tartness when you bite into a bit. 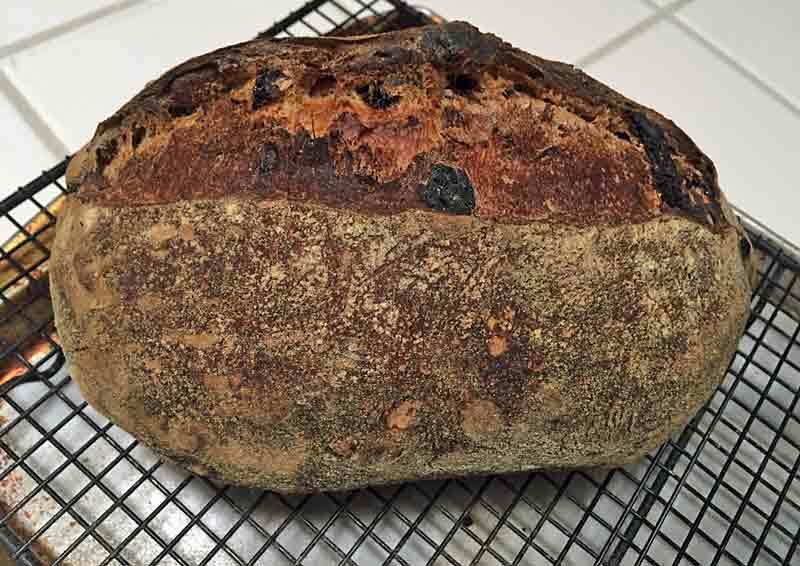 I have baked cherry-pecan sourdoughs several times, but this is the first time I based one on Hamelman's "Fig-Hazelnut Levain." It is very good and was a big hit at a pot luck to which I took it. I think it could be improved though with a bit more hydration and the addition of some rye and more whole wheat. We are back in VA for the finish of July then back to our home in AL . I haven't baked since early May so was pleased to see my starter go UP quickly with a light feeding x2. Have a raisin,date,pecan SD mid SandF based somewhat on Danni's post. Added some brown sugar as well to the mix. We spent 1 month in Northern CA on the coast , all of June. Was an amazing experience but very chilly/foggy till about 1 pm most days due to the inland heat wave. Glad to have hiked a lot of miles in the Redwoods and along the Lost Coast from Shelter Cove. Camped every night so feel like we got the full benefit of our time in the area. It sounds like you had a nice time on the North Coast of California. It's a beautiful part of the world. And you got back to the SE in time for the worst of Summer's heat and humidity! We're going to go over to Carmel for a week of the Bach Festival later this month. We need more plans to get out of the heat for August. The granddaughters and their parents will be visiting very briefly in connection with a trip to Sequoia. Nothing nearly as ambitious as your cross-country bike rides! Ooh! Ooh! The Copper Country! Our cycling friend has lived in Sobeiski WI his whole life. He knows the UP really well but has never cycled the routes we are riding. I got a great map of the area for cycling from MDOT. It is wonderful and has all the info we could want about camping etc. We plan to definitely take two different routes. Thank you for the suggestions of more to see. When we did the Eastern part of the UP in 2015 we headed due north from Sobeiski to Munising and then over to Tuaquamenon Falls then Macinaw to Traverse City and down the coast through the wonderful Tunnel of Trees there.....we love those areas !! We took the Badger back across and rode back to his house in Soebiski. We carry everything and camp every night. Hope the skeeters are on holiday....somewhere else !!! Hi All and dmsnyder, I am new to bread with wild yeast. I like the texture of your Sour Cherry, Pecan Pain au Levain. Do you mind to share your recipe and instruction how to make this bread? As I said in the OP, I am not totally happy with this bread. 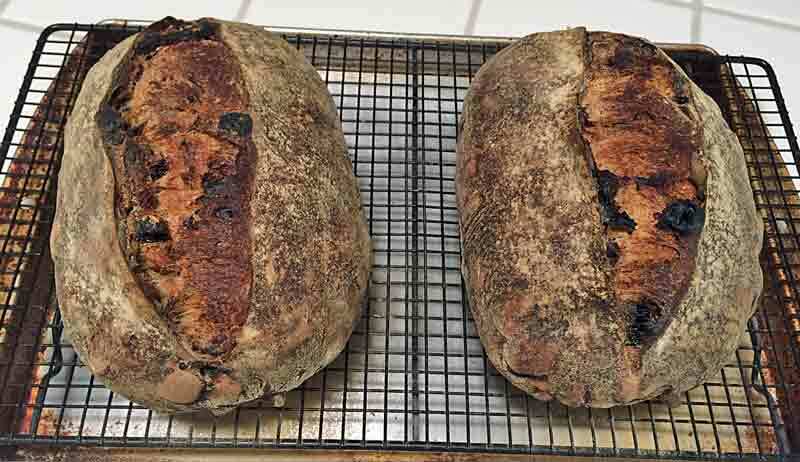 If you want the formula, it is the Fig and Hazelnut Levain in Hamelman's "Bread." If you want the formula I think would be even better and intend to make next time, see Sourdough Fig-Walnut Bread, a new and improved version. Just substitute dried sour cherries for the figs and pecans for the hazelnuts. Actually, I think you could bump up the fruit and nuts a bit with good results. Mmmmm, I've got Fig Nut sourdough fermenting in the fridge right now, for baking later this evening. I use toasted Brazil nuts and add a bit of honey, some poppy seeds and ground cardamom, and it's divine. 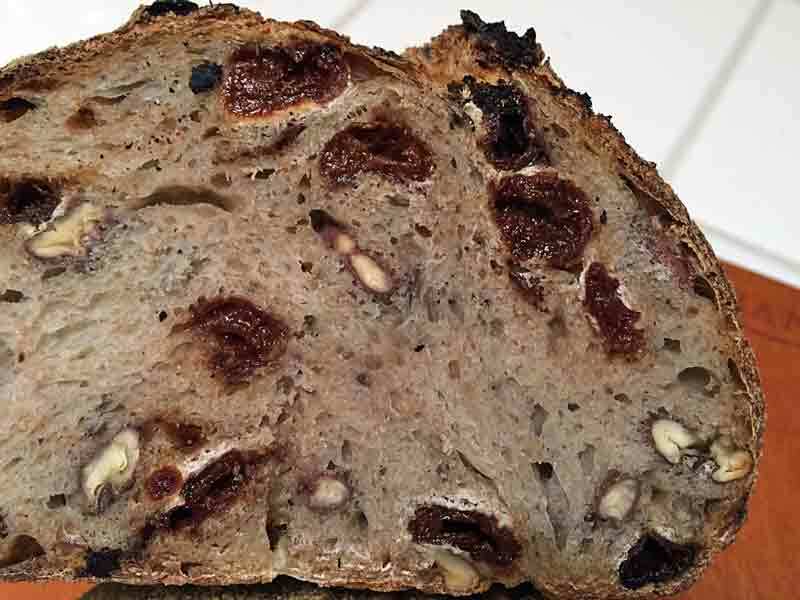 I like dried cranberries in bread too so your sour cherries would be very good! Also just made a test loaf of gluten-free blueberry almond bread, but need to tweak the flour mix, hydration and binders a bit. Fruit and nuts are awesome in bread! I like the looks of the crumb on yours, but I agree that maybe a bit higher hydration would be good; mine is a bit stiff too. We're heading up to Haida Gwaii in a week or two. Cool and damp there, but it's way better than the rest of the Province which is currently on fire, as well as being hot and dry. Haida Gwaii (where I have never been) sounds wonderful, as I sit here in 101 dF with air smelling of smoke from forest fires 150 or more miles up-wind. I am afraid to even take a walk in the cooler early morning, protecting my lungs. That is a super nice loaf! I can almost taste it. I hope you manage some cooler, clear air soon - and can get out to enjoy what is left of summer.